The Gillard government is confident that voters will soon forget the carbon tax that started on Sunday. But many people will be hit with a double whammy when they see their electricity bills. Although little attention is paid to this factor, the tax will come on top of continuing steep rises in the cost of distributing electricity over the poles and wires that connect generators to the customers. The government is giving low-income earners generous compensation for the impact of the tax, which Treasury estimates will lead to a 0.7 percent increase in the consumer price index compared to over 4.0 percent when the GST was introduced in 2000. Although rising electricity bills are the main source of political friction surrounding the carbon tax, the compensation is not designed to cover the impact of the rise in distribution costs. Nevertheless, the government’s 1.7 percent increase in the Age Pension should cover the combined cost. However, the compensation for low-income earners who are not on a pension won’t stretch that far in many cases. The Australian Energy Regulator (AER) approves increases in distribution prices five years into the future, with variations from state to state. But the AER is not the villain in the piece. Its chair David Reeves has spoken out against the regulatory rules that lead to unnecessarily high prices. So has the chair of the Australian Competition and Consumer Council Rod Sims. What is bizarre is that the Resources and Energy Minister Martin Ferguson could have done a lot more to modify the rules that the AER has to implement at the behest of a separate commission. Legislative change would need the cooperation of the states. But they have a motive to back changes as they cop much of the blame for AER price rises that their own regulators are obliged to pass on. While the NSW and Queensland government can benefit from owning the distributors in their states, federal Labor governments could have hammered them politically for blocking measures to reduce price rises. In any event, the Gillard government has not fixed the problem before the carbon tax piles on top of the sharp regulatory rises. The NSW Independent Pricing and Regulatory Tribunal (IPART) recently announced that it will increase electricity prices by average 18 percent. The main factors are a 8.4 percent rise in distribution costs and 8.9 percent for the carbon tax. In contrast, IPART said generating costs would fall by 0.8 percent (excluding the carbon tax). Based on AER figures, the Energy Users Association of Australia calculates that distributors’ revenues— a good proxy for price rises — will increase nationally by an average 7 percent a year in real terms between 2011 and 2015. This is roughly double the rate of the last 10 years, yet it is hard enough to justify the earlier increases. Reeves says the AER has to follow rules that encourage 'over-investment'. In effect, it has to give the distributors a generous profit margin on whatever new capital spending they plan to make. Most other businesses could only dream about making a guaranteed profit on whatever they spend. With distribution, the government’s former climate change adviser Ross Garnaut says it leads to 'gold plating'. Several observers note that over $10 billion has been spent to cope with a surge in demand that is confined to four or five extremely hot days a year. Options to restrain demand include paying companies with back up generators not to use the grid during these days. The Gillard government has compounded its political problem of rising electricity prices by starting with a carbon tax of $23 a tonne when the international price is under $10. The smarter route would have been to start with a $3 a tonne tax, rising by $3 a year for 10 years. That would only increase the CPI by a barely noticeable 0.1 percent a year. The starting price is irrelevant for investors in clean new technology. They need to know where prices are going after their investment becomes operational. But the $23 starting price is likely to fall to the $15 floor price that the government will establish when it moves to an emissions trading market in 2015 linked to overseas prices. That will make life a little easier for low income earners. However, because the $23 price would not be high enough to make 'dirty' coal-fired generators uncompetitive, the drop to $15 will ensure that Labor’s trading scheme can’t achieve its promise of a 'clean energy future' for Australia. China, Taiwan, Korea and other nations in our area are not going to follow the example of Australia. They will continue to generate pollution and our carbon tax will be ineffective apart from giving Vinnies and Salvos many more clients because of the poverty that will increase. Who is so deluded as to think a little payment from the government can compensate for the inevitable food price hikes, increased refrigeration and heating costs, lost jobs and closed businesses. The thing Gillard does not grasp is that there are other ways of dealing with pollution - not just her economy crippling way. While people sneer that the sky did not fall in, will they start new businesses, employ unemployed young people or pay the increasing bills for those who can't pay? As the cost of electricity continues to skyrocket, the price of goods and services will also rise as companies pass on their additional costs to consumers. The low income earners are suffering badly now and any more higher costs will reduce their capacity to pay their bills and put food on the table. In Tasmania, many people are paying $1,000 a quarter and those on pensions and low income cannot cope. Many are falling behind in paying their bills and many of those who have their own homes or paying a mortgage are afraid they will have to sell their homes to be able to exist. Those who can't afford a home have to pay increased rental and are struggling very badly. Many people are now unable to save, buy goods and exist instead of enjoying life because every penny that comes in goes out in bills. With more and more people unable to afford goods and services, more businesses will find it tough to sell their products and more people will lose their jobs and will have to exixt on very low centrelink payments. There is absolutely no reason to increase electricity costs and in fact the governmnet should be looking at ways to reduce the cost of electricity, petrol and other measures to allow those who are on a pension or a low income to increase their spending power to increase jobs and production. While I understand what Brian is trying to tell us in his article,the fact that CO2 pollution , the excessive amount of Carbon Dioxide that we are putting into the Atmosphere/Ocean system is leading to climate change at a rate not seen in at least 10,000 years.While we may not see the climate change in our lifetimes, it is very clear that future generations will , with dire consequences . While we are small players population wise, we are one of the largest contributors per person . The whole idea of a carbon tax is to make us reduce our use of carbon as an energy source and to move to less harmful forms of energy sources.We are a very well off country .We can afford to make this sacrifice.Skye is quite wrong to write that other countries are not making an attempt to reduce Carbon use, they are, not necessarly by taxation. What worries me is that our excessive use of the earth's resources means others live in poverty.There is NO way that the earth can suuport all the planet's population at our standard of living.We hear very little from our Church leaders on this increasinly serious social justice issue. The greater sin is not doing anything about respecting and preserving the ecology. Without an ecology we have no economy, I would prefer to pay for what energy I use. Turn your light out and your bill will decrease, take positive action and stop being selfish. At the risk of being howled down and labelled as a climate change skeptic can anyone explain to me how it is that CO2 by itself is responsible for global warming? Since CO2 is heavier than air, it seems to me that it settles close to the earth's surface and is eventually absorbed by photosynthesis. It cannot form a cloud in the upper atmosphere to blanket the earth and keep the heat in if it's heavier than air, can it? If so, how? A more likely explanation for global warming (it makes sense to me anyway) is that we are creating more energy, which in itself warms the atmosphere and raises its temperature. CO2 is just a consequence, not a cause, since most of that energy is created by burning carbon. If not, then it follows that it doesn't matter how much we reduce CO2 output if we don't reduce total energy output. The three lines of comment from Michael Gravener contain more truth than the sum of other contributions, with a few exceptions. In a century or so, human beings will look back on the present generation as being careless, selfish or stupid - or all of these. We (or at least the people of 'developed' nations) are consuming or damaging components of the earth without regard to future generations. Surely we can live comfortably and happily without wrecking the planet. In reply to Ian, CO2 is continuously emitted into and absorbed from the atmosphere. It is the BALANCE of this process that we are shifting by our emissions, rather than the quantity of CO2 involved. A small quantity can tip the scales. Concerning the "creation of energy" warming the earth, while it is true that much of the energy is wasted as heat, but the quantity of such waste heat is insignificant relative to the total solar energy falling on the earth. The problem is that more of the sun's energy is trapped by the extra CO2. Ian, you're not entirely wrong. Global warming is not caused just by C02, but a range of 'greenhouse gasses' including methane and nitrous oxide. But you are mostly wrong, and you should probably refrain from taking on the entire scientific establishment before even consulting wikipedia. There are some issues which the general public is ill-equipped to understand, and this is one. Thankfully, we have elected a government prepared to show leadership. Skye, Trent. Check your curtains. Mine have faded already. Gavin, I agree that global warming matters. 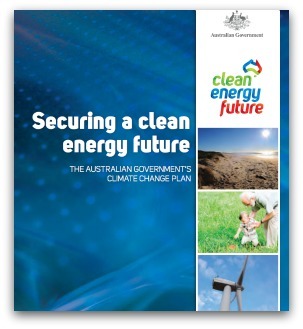 My point is that an Emissions Trading Scheme will not provide the “clean energy future” for Australia that the government promises. The reason is that the proposed ETS looks like starting with a price of $15 a tonne for a pollution permit in 2015. When AGL recently took over the Loy Yang A brown coal-fired station in the La Trobe valley, its financial advisers estimated that this generator would still have the lowest costs in the nation if the carbon price were $50 a tonne. As a result, an ETS will provide no incentive to switch to zero emissions fuel sources. Brian T.
What everyone wants to know is by how much will Australia's carbon tax lower the world's temperature. So what's your solution, Brian? Hopefully the rise in electricity costs, which will include the carbon price, will encourage people to reduce their consumption of electricity. It is interesting that countries such as Australia and the U.S.A. are not doing much to promote renewable sources of energy. Germany is doing the most in it's use of solar and wind power: 20% of power in Germany is derived from renewable sources. There is also a very interesting pilot project in the Ruhr Valley in Germany which is a hydroelectric power plant use of disused coal mines. Germany are closing their nuclear power plants and some coal mines. China are also doing a lot in it's use of wind power with the production of wind generators. In Mongolia 20% of power used is generated from wind generators and 2% of power used nationally is generated from wind. Unfortunately, China will continue to need coal for some time. In Japan all 53 nuclear reactors have been closed because of public concern that the country is susceptible to earthquakes. The closure of these nuclear power plants has resulted in a 30% reduction in power availability that has meant minimal inconvenience. People such as Skye, Trent, Peter and Ron Cini should focus their energy on lobbying the government to develop policies for renewable energy sources such as solar and wind. Ian describes himself as a climate change sceptic, and assumes that because CO2 has a relatively high molecular weight, it tends to remain in the lower atmosphere. This is plain wrong - gases are sufficiently energetic to be pretty well uniformly mixed. The following might help Ian out of his confusion. Observation 1. Sun irradiates earth with short-wave energy. Observation 2. Earth re-radiates long-wave energy. Observation 3. Greenhouse gases retard transmission of long-wave energy, not short-wave energy. Inference 1, drawn from observations 1, 2 and 3. Greenhouse gases thus regulate earth's temperature. Altering atmospheric greenhouse gas content therefore alters earth's temperature. Observation 4. Arctic sea ice is melting, so that summertime sunlight is being absorbed in exposed ocean rather than reflected off ice. Observation 5. Greenland and Antarctic ice is melting, increasing the rate of sea level rise. The rate of ice melt is accelerating as atmospheric greenhouse gases increase. Observation 6. Siberian permafrost thaw releases stored methane and carbon dioxide, and warming Siberian continental shelf releases methane from submarine methane clathrates ie runaway global warming. Inference 2, (drawn from inference 1 and observations 4, 5 and 6). Ocean is thermally coupled with atmosphere, and transfers heat to polar regions. I'm not a fan of the Clean Energy Futures dog's breakfast - far too complex, far too corruptible, far too beneficial to derivative traders - but it's nowhere near as bad as Skye seems to think. Instead of the Clean Energy Futures dog's breakfast, I'd recommend setting a consumption tax on fossil fuel (FFCT), then adjust it up or down to achieve the emissions target you want, and adjust other tax rates around that FFCT. It really is as simple as that. I'd be interested to read Skye's proposals for dealing with pollution.